A small lobe, or lobular part of a lobe. Lobule is used to describe the two rounded parts of the distal edge of the cat’s heel pad, reserving lobes for the three larger parts of the heel pad. Rounded parts of a heel pad. The heel pad of cats is made from three lobes. 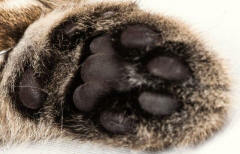 There are two smaller lobules on the distal edge of the main (central) lobe of the cat’s heel pad. 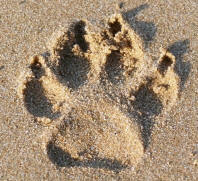 Lobes are also usually apparent in tracks of felids.